How to find a good first car and how to get car financing! So, you’re in the market for your first new or used car. Congratulations! The open road awaits you! You probably have questions about the process — how to find the right first car, how to go about buying it, and how to secure financing for your purchase. We’ve got answers! Below are some commonly-asked questions our customers often have as a first-time buyer. Let’s get into it! Say you’ve found a sweet used car at del toro auto sales in Auburn — great condition, low miles, and it’s got everything you need. Looks like a great first car, but how do you pay for it? When you finance a car purchase, you’re borrowing money and entering a contract to repay it over time, usually in monthly payments. This is a standard practice, and lots of people use financing to purchase larger items like vehicles and big appliances. At Del toro auto sales, financing is different from the haggling you might face at traditional new- and used-car dealerships, where you negotiate financing terms and may experience a lack of transparency. At Del toro auto sales in Auburn your sales consultant doesn’t get paid based on your financing terms! Here’s how the process works. 1. Do your research and establish a budget. Take a good look at your needs for your first car, including your driving requirements, to make sure you get behind the wheel of a vehicle that suits you for as long as you plan to keep it. Use our online calculator to understand the costs and the benefits of making a down payment. Check your credit score — your credit will be a factor in your available financing options. Understand the financing terms you’ll be hearing about as you go through the process. Your used car research will pay off. 2. Get pre-qualified. This gives you an idea of how much you can spend on your purchase. 3. Come see us at Del toro auto sales in Auburn. We’ll sit down with you to go over available financing options. Finance decisions come directly from our finance sources, usually within minutes of submitting your application. How do I budget for a used car? Do yourself a favor and make a budget for your first car purchase. Giving yourself some realistic guardrails will help make car ownership easier on your wallet! Most financial institutions recommend budgeting no more than 15 percent of your gross monthly income on a monthly car payment. When you’re budgeting, use an online calculator to get a feel for vehicle prices, down payment amounts, monthly payments, and annual percentage rates. In addition, check out these great ways to save on your next used car and additional helpful tips for the first-time car buyer. So, when you’ve got your eye set on a used Hyundai or Honda — two solid-value choices for the first-time car buyer — you can make your purchase more confidently, and with less worry about paying for it. How important is a down payment? A down payment is the amount of money you put down at the time of your purchase. Some dealerships require a down payment, but at Del toro auto sales, making a down payment isn’t a requirement in all situations. But it is important. If you’re looking to buy a Ford or Kia for your first car, making even a small down payment — even $100! — is better than nothing at all. That’s because it reduces that amount you’ll need to finance and your monthly payment amount. 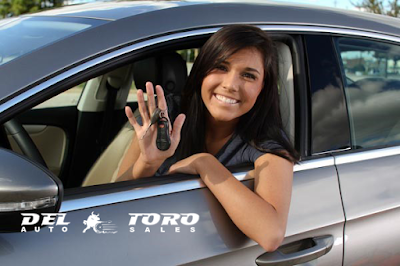 If you have a vehicle to trade in, you can get your car appraised (yes, you can put your offer from Del toro auto sales toward the purchase of a used car or truck at Del toro auto sales). Can I get approved if I have no credit? How about bad or damaged credit? We successfully provide options to customers with many different credit profiles because we work with some of the state's leading financial institutions, which improves your chances of getting approved. If you’d like to learn more about credit scores and ratings, check out our article about understanding credit ratings. Can I finance through my bank or credit union? At Del toro auto sales, yes you can. Just bring your outside financing when you come to visit us at our Del toro auto sales Auburn location. How do you decide where to buy? We won’t tell you where to buy your first car or truck. Some dealerships may give you what you’re looking for — and others might give you the feeling that you’re being taken advantage of. But here at Del toro auto sales in Auburn, you can feel confident that we’ll never pressure you into making a purchase. We want you to find the used vehicle that best fits your needs, for as long as you plan to own it, and we have a no-haggle, no-pressure approach that lets our customers focus on finding a vehicle that’s right for them. You’re embarking on an exciting adventure — good luck with buying your first vehicle, and whatever you buy, we hope you enjoy it.